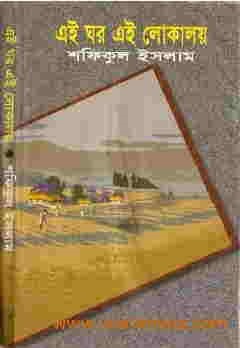 Eai Ghar Eai Lokaloy Poetry Book by Shafiqul Islam ebook pdf. Eai Ghar Eai Lokaloy by Md. Shafiqul Islam. Eai Ghar Eai Lokaloy Poetry Book is written by Shafiqul Islam. Md. Shafiqul Islam is a Modern Bengali Romantic Poet in Bangladesh and also all Bengali regions. He is most popular in all youth and young generations. He is Ex Metropolitan Magistrate and Ex Additional District Magistrate, Ex General Manager at Bangladesh Road Transport Corporation, Now Deputy Secretary of the people’s Republic of Bangladesh. He is a Poet & Lyricist of Bangladesh Radio and Television. He has Awarded Bangladesh Council Literature Award and Nazrul Gold Medal Award for his poetic excellence. He has been Written some romantic books of poetry are Ekti Aakash O Onek Brishti, Eai Ghar Eai Lokaloy, Tobuo Bristy Asuq (Thirst for Rain), Shrabon Diner Kabyo (Song of Rainy Days), Megh Bhanga Roddur (Sunlight on Cloud), Dahan Kaler Kabyo (Verses of fiery Days) and Protoyee Jatra (Indomitable Journey). Readers Eai Ghar Eai Lokaloy poetry book as pdf, Look now in this page below.